Regalia Miami was developed by Beach Developers, designed by architect Bernardo Fort-Brescia of Arquitectonica, and decorated by interior designer Charles Allem, a South African based designer who is one of the most recognized in the world. Regalia Miami is comprised of 39 full-floor, oceanfront residences, each with over 5,515 square feet interior square feet; large, wrap-around terraces with over 2,100 square feet; private elevator entry; and 10-foot high ceilings with floor-to-ceiling glass windows offering 360-degree, unobstructed views of the Atlantic Ocean, Intracoastal Waterway, and city. Additionally, each condo residence at Regalia includes a Crestron smart panel allowing personal access to residence functions and connection to all building services while home or away from home, Kreon designer lighting throughout, custom Italian kitchen cabinets, stone kitchen countertops, Chef island with oversized Miele cooktop and custom hood, two 36-inch side-by-side SubZero refrigerators, 100+ bottle SubZero temperature-controlled wine cellar, huge his and hers walk-in closets, summer kitchen, and much more. Regalia condos offers its residents a number of world-class amenities, such as oceanfront jacuzzi, private beach and poolside service, private poolside cabanas equipped with refrigerator and sink, state-of-the-art fitness center, yoga room, business center with video conferencing, children’s playroom, designer Chef’s kitchen, temperature-controlled wine storage lockers, pool deck with an infinity pool overlooking the ocean, an indoor-outdoor spa, and more. 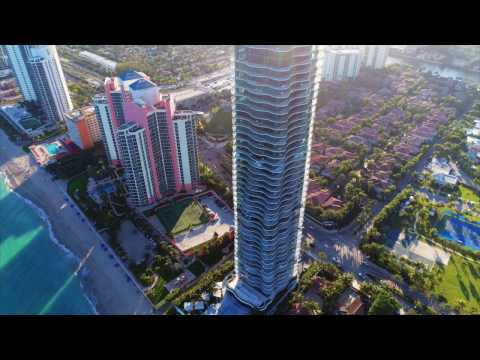 Regalia Miami is located in Sunny Isles Beach at 19575 Collins Avenue. The luxury tower is conveniently located to all that South Florida has to offer including the amazing shopping experiences at the Bal Harbour Shops and Aventura Mall, the fabulous restaurants on Las Olas Boulevard in Fort Lauderdale, the eclectic nightlife in South Beach, and beautiful art in Wynwood Miami. Within walking distance of Regalia Miami is Jown Tweedle Park, Heritage Park, and Miami Juice. What is the pet policy for owners and renters at Regalia? Regalia is a pet-friendly condo development for both owners and renters. The pet policy permits each residence to have no more than three (3) pets, each with a maximum weight of 25 pounds. There is no pet fee required by the condo association, prior to move-in. Which utilities are included in the Regalia condominium association dues? Basic cable and internet (Hotwire), water, sewer and trash removal are included in the condominium association dues. WIFI in lobby. What are the rental restrictions for Regalia condo?